I don't think writing instruments from Graf Von Faber Castell need much introduction. The use of fine materials and meticulous craftsmanship makes Faber Castell writing instruments a premium choice for pen enthusiasts and collectors alike. Renowned for its novelty, Graf Von Faber Castell has become even more radical with the introduction of "Pen of the Year" series. The renowned "Pen of the Year" series was first introduced in the year 2003, since then the series is considered as a pinnacle in Graf Von Faber Castell's line up of exquisite writing instruments. "Pen of the Year" series is the most expensive collection of writing instrument amongst Graf Von Faber Castell's heritage of luxury collection, and are designed by most skilled artisans. Till date 14 "Pen of the Year" have been introduced and all of them are titled with hallmark of excellence. The Elegant Graf Von Pen of the Year 2016 takes its design from the Vieux-Laque Room of Schönbrunn Palace. This beautiful writer completes the trilogy series of writing instrument designed to commemorate era defining places and personalities. The first of the series was introduced in 2014 and was named after "Catherine Palace" in St.Petersburg. Extending the series, in 2015 Graf Von Faber Castell introduced the elegant “Sanssouci, Potsdam” Pen of the Year. The Vieux-Laque room was remodeled by Empress Maria Theresa in loving memory of her beloved husband Emperor Franz Stephan. The Emperor had an affinity for lacquer, and to symbolize her timeless love the empress decorated the room with lacquer - which was then considered as an epitome of luxury. Black lacquer panels from Peking were set into walnut paneling and embellished with gilt frames. The empress also commissioned several portraits for this room which still hang there. The posthumous portrait of her husband by Pompeo Batoni was completed in 1769, four years after the death of the emperor. The new Graf Von Faber Castell Pen of the Year 2016 is a beautiful interpretation of the historic room designed by Empress Maria Theresa. The Conservator of the of the Vieux-Laque Room Silvia Miklin and master of Maki-e technique Tomizo Saratani have combined their expertise to create this fascinating writing instrument. The beautiful motifs of the room are carefully illustrated on the pen, reflecting timeless art of the era. The allurement of the Graf Von Faber Castell Pen of the Year 2016 is defined by the use of three sophisticated elements. Each of the three elements are first painted in black, then polished and burnt several times by hand. The provocative design of the pen is further enhanced by lovely artwork sprinkled with 24 carat gold powder to bring out the theme of the Vieux-Laque Room. Each "Pen of the Year 2016" is embellished with a black onyx which gels stupendously with the design of the pen. Like all the previous editions, the new Graf Von Faber-Castell "Pen of the Year 2016" also comes with 18k bicolor gold nib. The quality of these outstanding nibs complements the astonishing design of the pen. 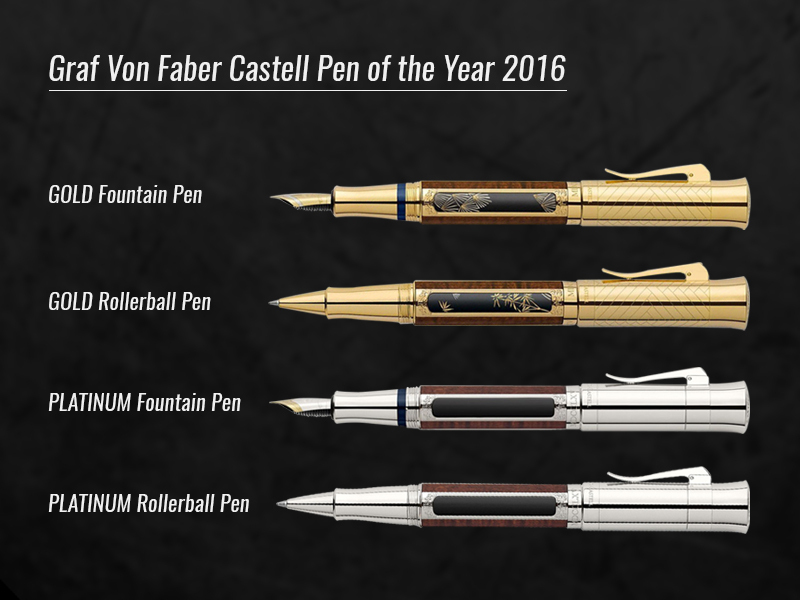 The Graf Von Faber Castell "Pen of the Year 2016" is available in platinum and gold version. Both versions are available in two different writing modes, rollerball and fountain pen. The numbered pens are available in limited numbers and come in a distinct black wooden case with an authentic certificate signed by the master craftsmen. This heart-winning collection will be available for a limited time period. So, before they start to fly out of our store order your "Graf Von Faber Castell Pen of the Year 2016" exclusively from Pen Boutique.